The personal car of Giuseppe Luraghi, the legendary Alfa Romeo-president and the father of Giulietta. At the 1957 Turin Auto Salon, Alfa Romeo presented the Giulietta Sprint Speciale in prototype form. 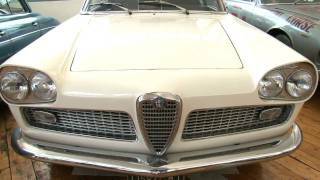 It was born from a study of a faster version of the Giulietta Sprint, during which in-depth aerodynamic research was carried out in order to enable the little engine Alfa Romeo to break the 200 Km/h barrier. The model went into production in 1959 embodying a number of styling updates and improvements and was offered as a more luxurious version of the popular Giulietta, as it was created with lightweight construction and competition in mind. Built on a slightly shorter wheelbase than the standard Sprint, the curvaceous ‘SS’ was powered by a 1.3-liter, Veloce-specification twin-cam engine, which had twin two-barrel Weber carburetors and offered 116 horsepower. Between 1957 and 1962, just 1,366 examples were produced. This example was delivered new in Italy to its first owner Giuseppe Eugenio Luraghi (1905-1991), the legendary Alfa Romeo-president, a manager who played a prominent role in the Italian corporate system for more than half a century, from the late 1920s to the mid-1980s. He covered prestigious positions from 1932 to 1950 in Pirelli and its subsidiaries. He became for a short time deputy CEO of SIP (an electricity company controlled by the big state-owned holding Iri) then in 1952 he became CEO of Finmeccanica, Iri’s sub-holding for mechanical industry, devoting special attention to Alfa Romeo and the business plan for the manufacture of "Giulietta". In 1960 he returned to the Iri group as chairman of Alfa Romeo and bought this car. Luraghi turned the company to mass-producing small vehicles rather then taylor-made luxury models. In the 1960s and 1970s Alfa Romeo produced a number of successful sporty cars. In 1971 the company, that was headquartered in Milan, opened a new factory near Naples (Alfasud) which enabled it to increase production from 200,000 to 300,000 cars a year by 1973. In the final years of his managerial career, Luraghi served as deputy chairman of the mechanical engineer company Necchi (1974–1979), chairman of the publishing house Mondadori (1977–1982), and deputy chairman of the textile company Marzotto (1979–1985).